It seems it will rain today, said my daughter while leaving for work. Don’t even speak of rain, I remarked having overheard her. Yes it was cloudy and there was likelihood of a shower or more. But I prayed in my heart: God don’t do it. If it did, my entire mango crop, like other brother farmers will be destroyed. Their year-long efforts would go waste and they incur huge losses. I’ve started thinking like a farmer. For a city dweller the rain brings in a respite from the sweltering heat nevertheless followed with increase in humidity and sweaty days. The appearance of the King is a joyous occasion. I mean the King of Fruits, the Mango. Though it may be called Aam in Hindi which means ordinary it’s in fact very khaas (special). If I had my way I would call it the sunshine fruit, thanks to its contents. It’s over a month since mangoes appeared on four of my plants. When I brought the images home, clicked with my phone, members of my family were delighted. It’s a nice feeling seeing your plants fruits. Since then with every visit the first thing I do is check the fruit’s length. Like the mother feels the growth of the foetus. As the fruits grow in size, the branches yield giving into its burden: This what I find remarkable. 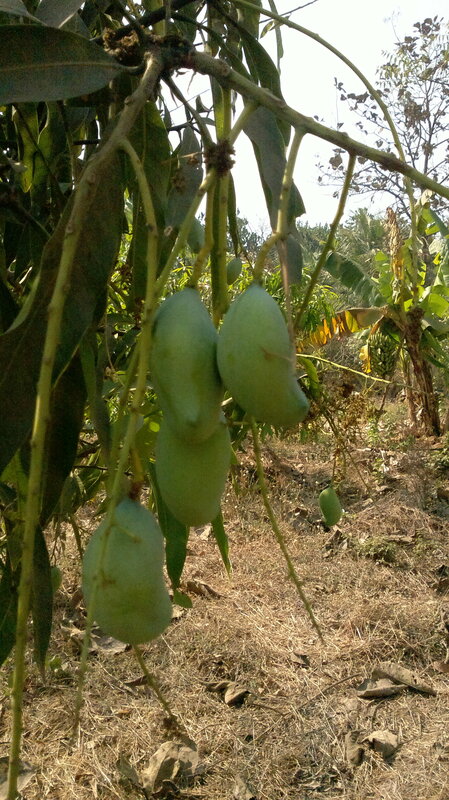 The mangoes are around four inches long though in the pictures they look much bigger. Which prompted wifey to say: You should have got couple of them for jam. How images can fool? It would be another month a half before they can plucked and brought home. It has been four years since I planted them—all, a year-old saplings, on a July morning. This year July It’s the turn of the Banganpalli duo who were waiting to be planted. I rarely write my posts so early in the day but here I’m today because I send this plea: Pleaaaaaaaaaaaaaaase no showers and hope its heard. You can divide people into two groups—those who love mangoes and those who don’t. Those who do, have their ‘mango memories’. Memories of the sunshine liquid oozing from the skin as you squeeze the fruit! My mango-memory is of collecting the storm-felled fruit beneath the giant and sprawling mango tree standing beside the monsoon river in my father’s ancestral village, Debipur, in Howrah district of West Bengal, which we visited during our summer vacations. The memories of those sunny, wonderful, summer days of never-ending fun and digging into juicy mangoes are still evergreen. The pre-monsoon storm, known as kal baiskahi in Bangla generally struck in the evening. More so when it was dark around, the moon cruising gently behind the clouds and stray lightening illumining the horizon krrakk, krrakk and krrakk. The wind singing shaeen, shaeen as we jumped out of the palm thatched hut running like a pack of wolves towards the lone mango tree, which I was told has been around since Pulin Bihari, my grandfather was just knee-high. Which meant that the tree had witnessed some sixty summers. Standing beneath the tree we couldn’t see much but heard the occasional thud, thud as the mangoes came down loosened by the wind and fell all around us. With battery torches in our hands we rushed to the source of the sound and picked the lime-green fruit. At times the fruits fell like a shower. Our makeshift bags and towels heavy with the fruit we rushed back home as the wind quieted. Next morning we would feast on our ‘catch’ squatting on mud floor. The unbridled pleasure of sinking one’s teeth into the succulent flesh, the juice dribbling down our chins, hands and arms, and licking one’s fingers in delight is still etched in my memory. As we returned, our 15-day long vacation over, and resumed our schools those kal baishaki evenings were forgotten overtaken with immediate worries of homework—school—homework. As we grew up our annual summer visits became lesser and lesser and my ‘mango memories’ rested somewhere in the recesses of the mind. Few years’ back I learnt that my uncle, father’s elder brother, who looked after our landed property had sold off the mango tree. The new buyer had chopped the tree down and made a good sum selling its timber. That was the day I felt as the throat of my mango memory has been slit. The stump of the tree still stands testimony to those days and tells the river when it flows that once here stood a mango tree which gave fruits to the world and underneath whom young foots came to play. Then, mangoes were just a summer fruit to be gathered from under the tree and enjoyed during summer vacations in our ancestral home. As I grew up and work took me to different places in the country I was introduced to the pleasures of fruit with exotic names like Dussheri, Langda, Totapuri, Alphonso, Kesar, Banganapalli, Fazli, Chausa and others and realized they each had a distinct taste and flavour. A year back I was introduced to Malgoba, thanks to a colleague. Grown in villages of Valsad, South Gujarat, the fruit which is harvested during May end is relished for its thick curd-like juice. Britain’s pickle king Lakhubhai Pathak sourced raw mangoes from Valsad namely Payeri, Rajapuri and Malgoba. Now a resident of Mumbai, the colleague hails from village Umarasadi in Killa Pardi taluka and tells me that the locals consume Malogoba juice like they are having water! Once the juice is ready a spoon of ghee, powdered dry ginger and cumin seeds and salt is added before downing it. How do you describe the joy of seeing a pair of mangoes hanging gently from a leafless stem of a branch, gently swayed by the passing breeze on a summer day? It becomes more difficult to give words to that when you’ve waited for three long years, having planted a sapling on a sunless June day after the earth has accepted the first showers with joy and humility. Happy that the days of parch just a memory. You have waited for three long years. Winter, autumn, summer and rains come and go. And then on a February you come across the flowers. A month and a half passes and the fruits of earth are shaped into a mango. Last week I picked up a bunch of them and brought them home and spread the labour of my love on the kitchen table. “Do you mean they’re from our farm,” wife exclaimed with happiness. By noon her mother, brother and her friends knew that Hiraman had been rewarded by the fruits of the season. The mangoes now reside in glass jars in our kitchen in their new avatar-jam. Harvest of sunshine and sugar. Coming back to describing the joy with which I began this post let me quote a poet: What does he plant who plants a tree? He plants a friend of sun and sky; He plants the flag of breeze free; The shaft of beauty, towering high…. Last Sunday when I visited I had the biggest surprise of my life as I went along checking out the plants. A routine I indulge in the moment I step into my farm. I stroked them, hummed a favourite song, checked out if there were any weeds around, whether any pest had attacked, remove the dead leaves, watered them etc. While I approached these two mango trees–one a Rajapuri and another Haphus. Hardly five feet tall, I saw them ringed with flowers and fragrant. In fact, the branches were stooping due to the weight of the flowers. You buy the ripe mangoes and have to finish them in the next two days. How about if you extend the shelf life of your favourite Dasseri, Langda or Aplhonso? That would soon be possible. 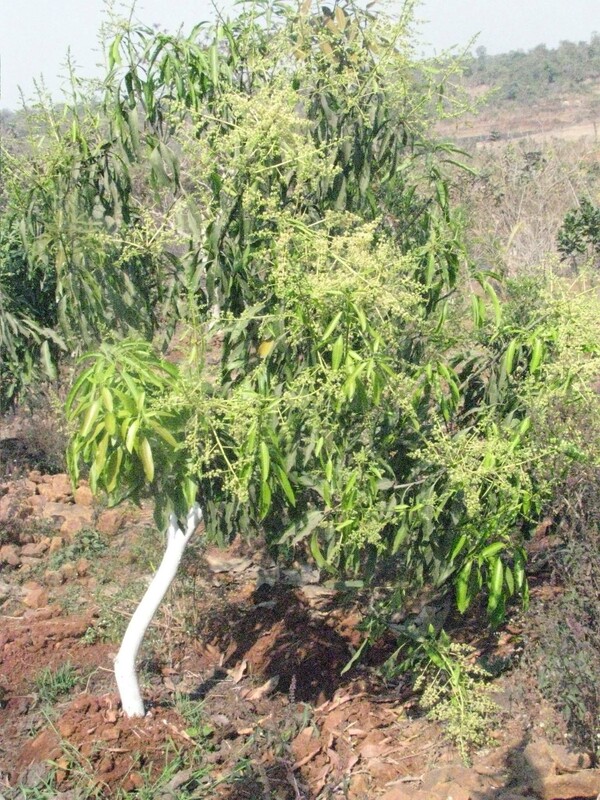 If the research now being conducted at the Central Institute of Post-Harvest Engineering and Technology (CIPHET), Chandigarh, meets with success, the shelf life of mangoes and guavas would be considerably increased. The Institute has come up with alternative edible coating materials from rice, cassava, chitosan and turmeric by developing starch-based edible bio-coating, with clinical trials still going on before it hits the market. Elaborating on the technique Dr Ramesh Kumar, scientist (horticulture), CIPHET, Abohar, Punjab, in an e-mail interview to The Indian Express, stated that the fruits are dipped in a starch-based solution, dried by air and conserved at ambient temperature. The formation of starch film or bio-coating is based on the principle of gelatinisation of starch that occurs above certain temperature with excess of water. After cooling, it forms a transparent film with properties of biodegradable product. These coatings are less permeable to reparatory gases such as O2 but are more permeable to water vapour, compared to commercial wax coatings and other plastic covering material. The bio-coating was now being tested for its effects on external and internal quality parameters for fruits like mango and guava. 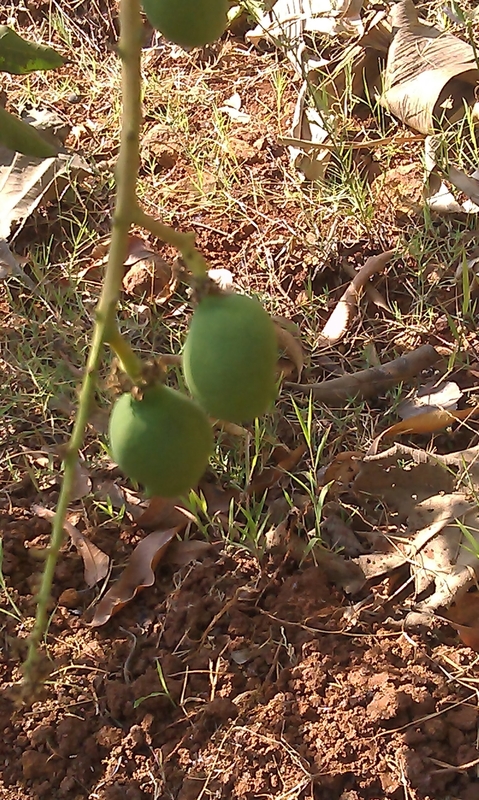 The research going on at present proved that bio-coating can extend the shelf life of mango by four days (even more days if moisture loss of fruit is checked) as compared to fruit that is not coated. Dr Kumar said the current developed bio-coatings presented beneficial effect in maintaining the fruit firmness even after eight days of ambient storage and the fruits were well accepted by the consumers at the end of storage period. I spoke to my plants today. After being away from my farm for over a fortnight in the hills of Himachal Pradesh I had been missing my farm and its green inhabitants. Mango trees as high as my shoulder, the lichi plant my friend brought all the way from Muzzafarpur and the jackfruit tree, which crossed my head in November, visited me in my dreams. I haven’t named them as yet but now as they frequent me in my sleep I think I should christen them. This Sunday I reached my farm earlier than ever, thanks to the 8.10am bus from Badlapur station which came dot on time. The summer months does wonder to the plants. They look healthy, are vibrant and waiting to be caressed. I said sweet words to my Ratna hapus, stroked the chikoo tree, sat down close to horizontally spreading fig tree, sang Nimboda, Nimbooda to my lemon tree brought from West Bengal, shouted at the banana plantain for refusing to gain height and did a jig around the papaya tree for being generous with its fruits which I have shared with my neighbours, friends and visitors to my farm. I never knew Napoleon Hill or Dale Carnegie’s tricks to make friends could be useful when dealing with plants too. It was scientist Jagdish Chandra Bose who said plants too have emotions and am seeing it in action. Care for them and they respond. I have yet to play music for the plants but have already downloaded some soothing Carnatic music on my mobile, which I plan to play on my next visit.